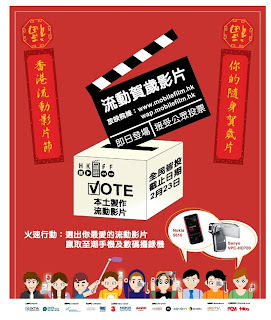 In their innovative drive to promote the "Fourth Screen" as a valid platform for the creation and viewing of video content, the Hong Kong Wireless Technology Industry Association (WTIA) and the Hong Kong Productivity Council (HKPC) have combined forces to launch Hong Kong's 1st Mobile Film Festival. 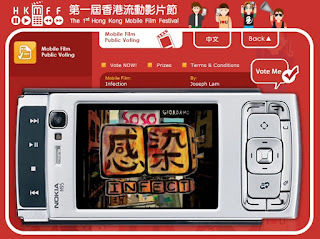 There are several categories of awards, including "Best Drama", "Best Animation" and "Best My Hong Kong", but only one has been opened to the public, "Nokia Most Popular Film Award". You can view all 15 submissions and select your chosen winner here. You'll need to enter your name, email and mobile number plus the first 4 digits of your HKID card. Some truly original works from a city that continues to prove that it is more than just a financial centre. DotAsia launch party - a new domain land grab? Stranded in China? Google to the Rescue!